Golf at Wildwood is quite an experience, with three courses of nine holes, this gives you the opportunity to play three different golf courses, Parkland & Lakes, Lakes & Woodland or Woodland & Parkland, this gives you the versatility of each course and its merits. Each nine holes has something different to offer the golfer whether you are starting out or a single figure player the courses are interesting to play. Each nine finishes back to the clubhouse, so you can arrange your golf so that you can play nine, pop in for a drink then play your second nine, or you can play nine holes in the morning, have lunch and then play 18 in the afternoon. We are happy to accept fee paying visitors, Societies or Corporate days, where we can offer you the bespoke package you are looking for to host your day. 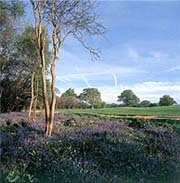 Take a look at our green fees on the golf section for our current offers. Our golfing members enjoy the ambience of Wildwood with its wonderful facilities, 2 clubhouses, a barbecue area with outside decking, where golfers can enjoy the sunshine ! or the wraparound terrace that allows you to watch and cheer your golfing colleagues play the last hole on each course. With a fantastic Par three facility as well as the main 27 holes, this is somewhere you can go to hone your short game before embarking on the main course, or ideal for the kids as part of their junior initiation into the club. The junior lessons or ladies academy lessons take place on the par three course & gives the pro as well as the golfer a wonderful short game area to practice upon. Our indoor academy also gives the professional a place to teach their pupils if the weather is inclement or if he needs to take videos or analyse a swing, then we have the driving range area which has Callaway range balls and separate bays where you can also warm up for your golf gameor take your lessons.